The flows have been steady in the box for the most part slight drops to match inflow. We are still getting a few rain storms. It’s the time of the year where an early morning streamer run through the box can be very productive. With the exception of seeing me every now and again you can have the box to yourself in the early A.M. More import than the actual streamer pattern make sure you have a good color selection. If the early float is not your thing then I would have the usual collection of #16 zebra midges and rubber legs. I would also have some #12 pheasant tails if I was fishing in the box. The brown drakes have arrived and with the drakes of course the crowds have arrived. The bugs have been thick and plenty of targets to cast to. A #8 last chance cripple or extended body brown drake will do the trick for you. If you’re a first timer to the ranch please be courteous to fellow anglers. We like to try to give other folks space out here. 100 yards is preferred 50 yards is pushing it. Under 50 yards is to close. If you see a fellow angler fishing the same bank you’re walking down, give the angler a wide berth. Continuing to walk on down the bank will put his or her fish down in most cases and you will more than likely get a well-deserved ear full. 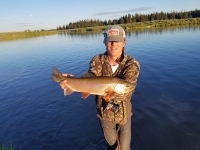 If you want to fish the ranch and avoid the drake madness, then start your fishing in the evening at the log jam. 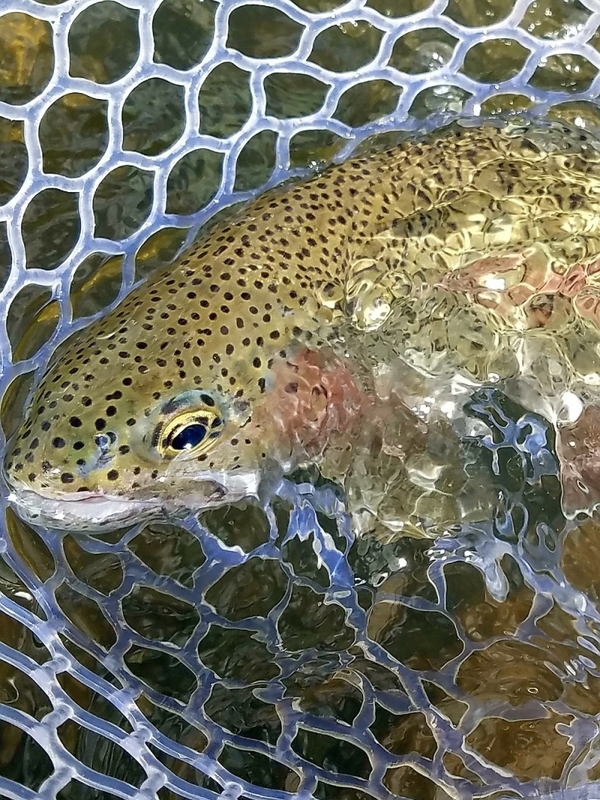 The caddis hatches have been great and plenty of fish to be had. 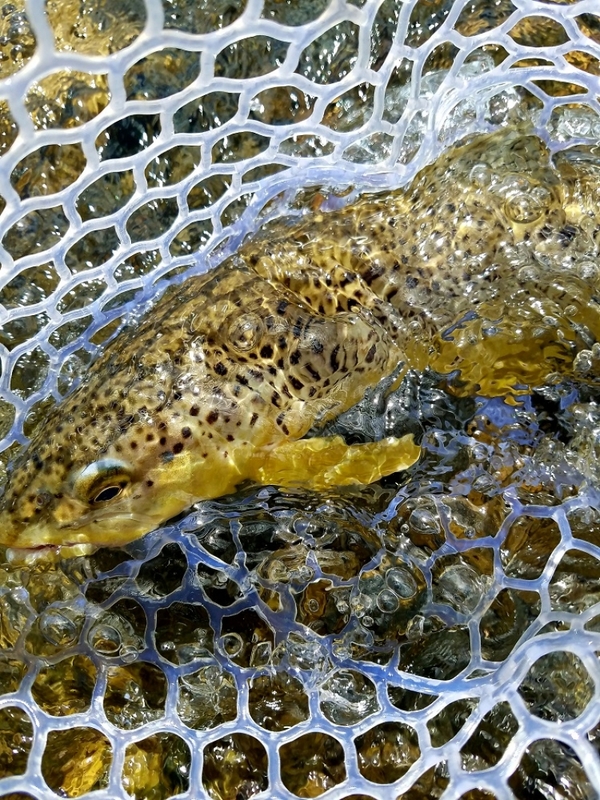 Lawson’s #16 spent caddis has been working very well. 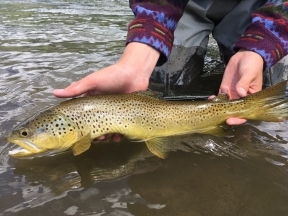 The appearance of salmon flies on both the South Fork and the Madison, crowds on the lower river have started to lighten up a bit. I really like it down on the lower stretches this time of the year. We still have great flows and the hatches have been great. I really enjoy fishing down on the lower river in the evenings. The caddis hatches have been as thick as I have seen them. There are also good flav hatches. I would have some flav spinners during the day and look for fish taking the duns in the evening. I would also have some spent partridge caddis in the evening and don’t forget some caddis emergers. The South Fork is still a tad high but the salmon flies are out. 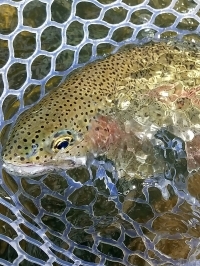 The water is still off color and the dry fly bite is not quite on just yet but that could chance any minute. I would go to the South Fork with some foam stones and rubber legs do a dry drop rig and drop your rubber legs about three and a half to four feet down. Fish the banks and don’t forget to have a look in the side channels. Hopefully the river will clear up soon and we should start to see pink Alberts soon. 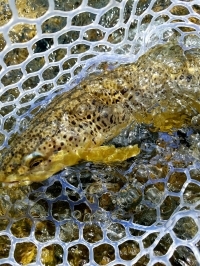 I would also have some yellow sallies for the South Fork. The Teton is also an option. 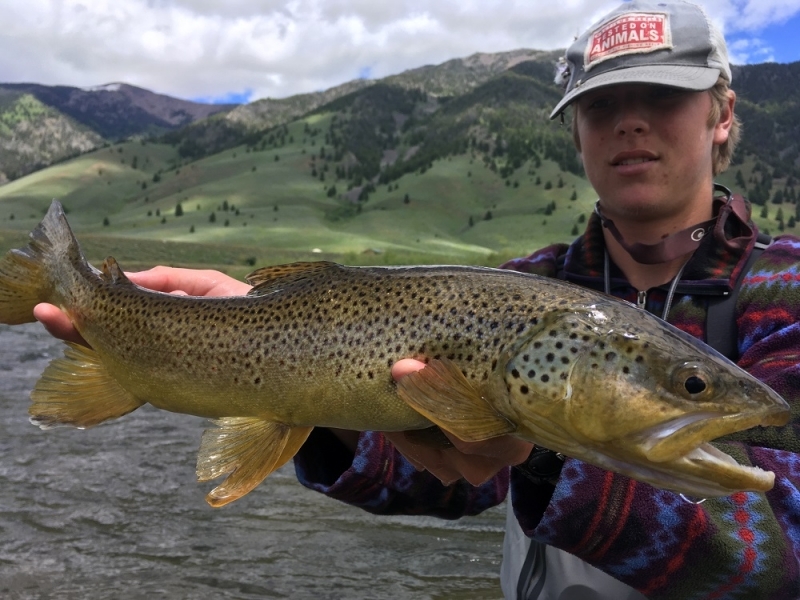 We have been running the Teton for a week with some great results. The Pmd and grey drake hatches have been awesome. I would also have some 16 duracell nymphs. 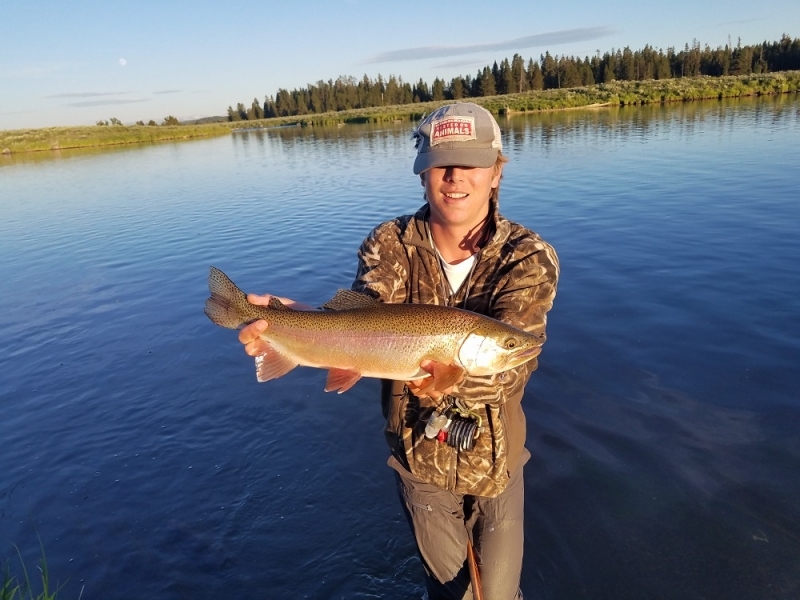 The Teton is just going to get better and better from here on out. If you have never been on this river, I would suggest you give it a shot. It’s a nice change of pace for sure. Salmon fly madness has also begun on the Madison. Just like anywhere else that has a good salmon fly hatch, the crowds are crazy. I did visit the Maddy just yesterday. We parked at the Reynolds Bridge, Shawn McKay and Tanner Lawson took one side of the river, I crossed the bridge and took the other. Personally I didn’t think the crowds were that bad but there were some folks around. I had no problem finding water to fish. The boys fished dry droppers and I fished a solo Henry’s Fork foam stone and had a great day. I think it’s a bit early to fish the big bugs up that high. I had to work a bit but was very happy at the end of the day. I also saw a few pmds and there were plenty of caddis around. If you plan on floating I don’t think you can go wrong with a dry drop rig.